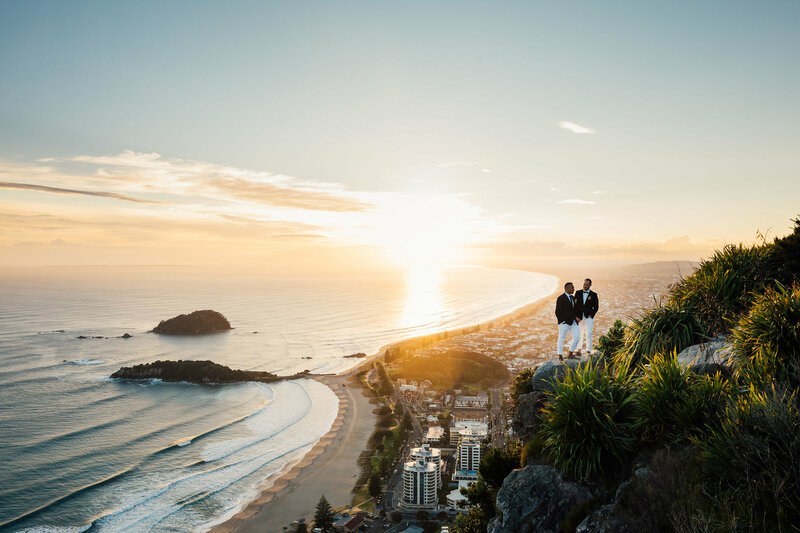 The talented team of vendors hiked all supplies up to the summit of Mount Maunganui in the dark at 4:00 am! 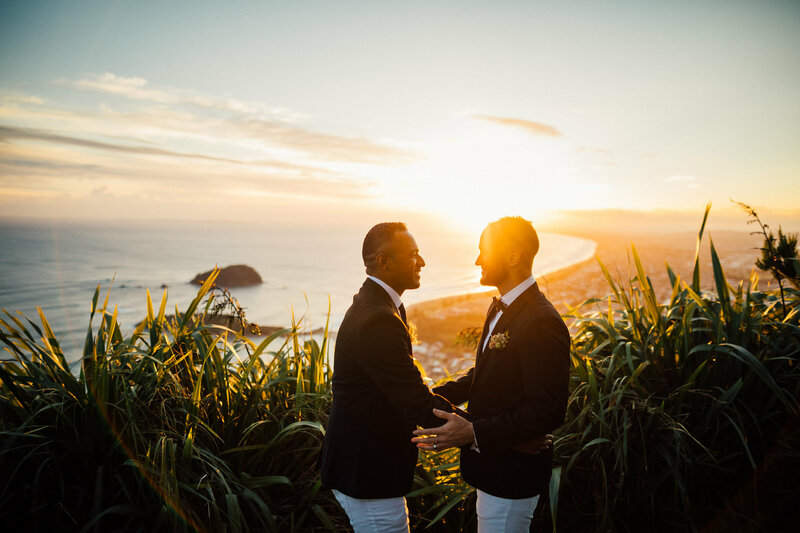 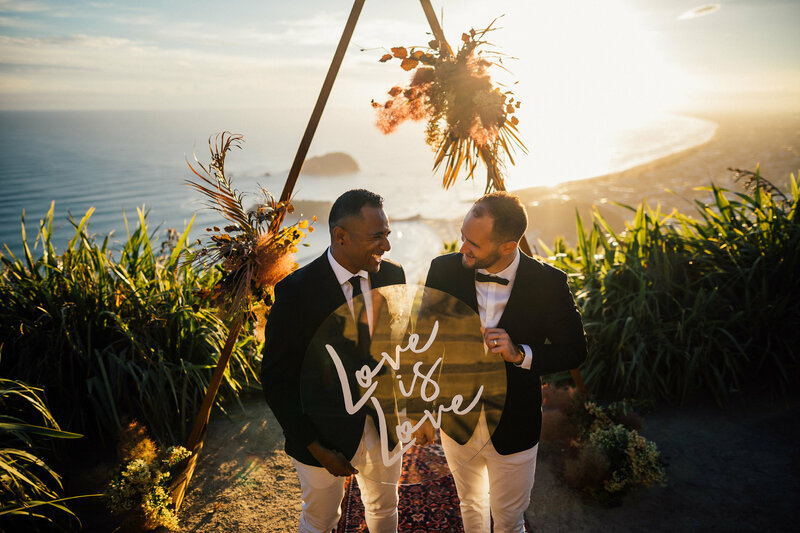 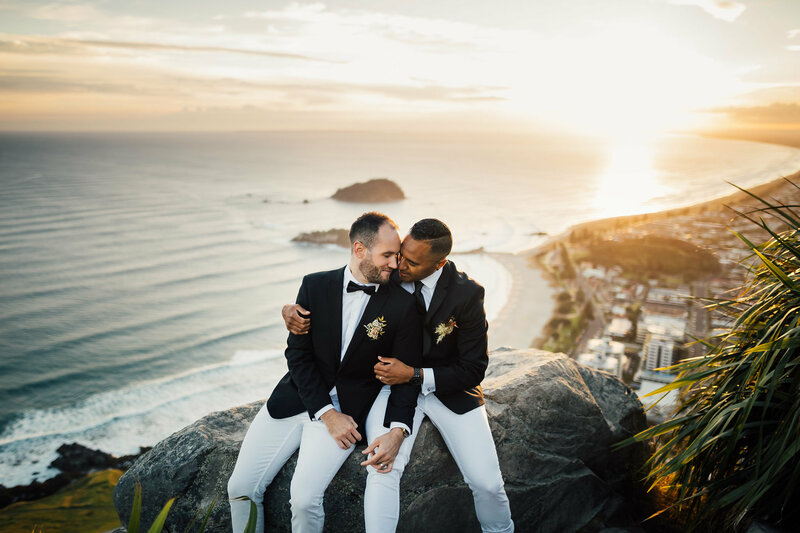 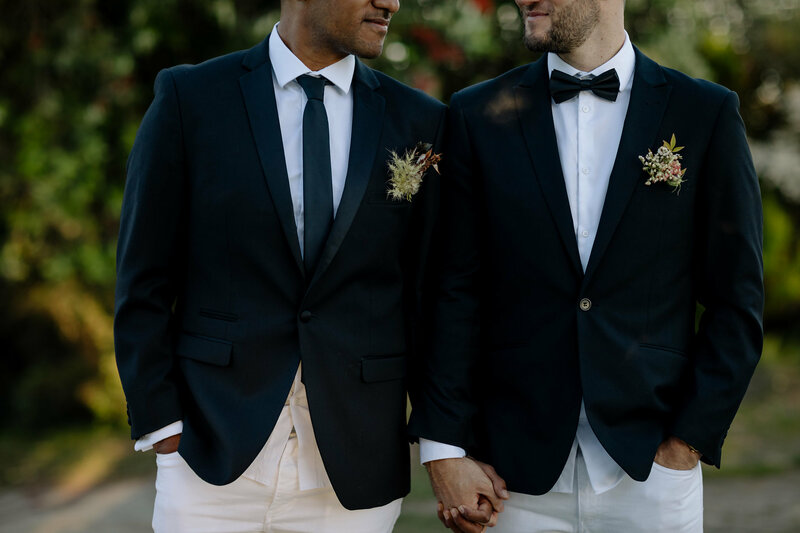 This location, at sunrise made for the perfect setting to celebrate the passing of the Australian law and to celebrate love in all its forms with no boundaries or labels. 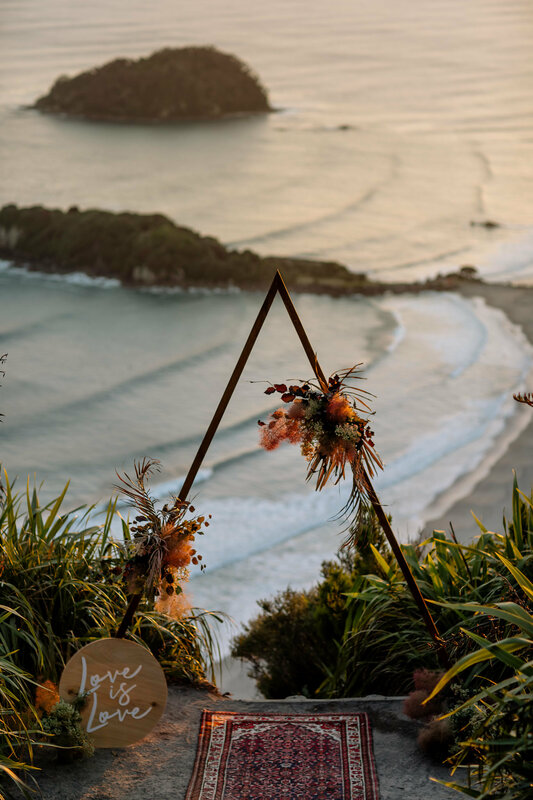 This was an unprecedented event for the iconic beachside mountain and the vendors received the blessing of the Mauao and local Maori, before setting out to create their magic. 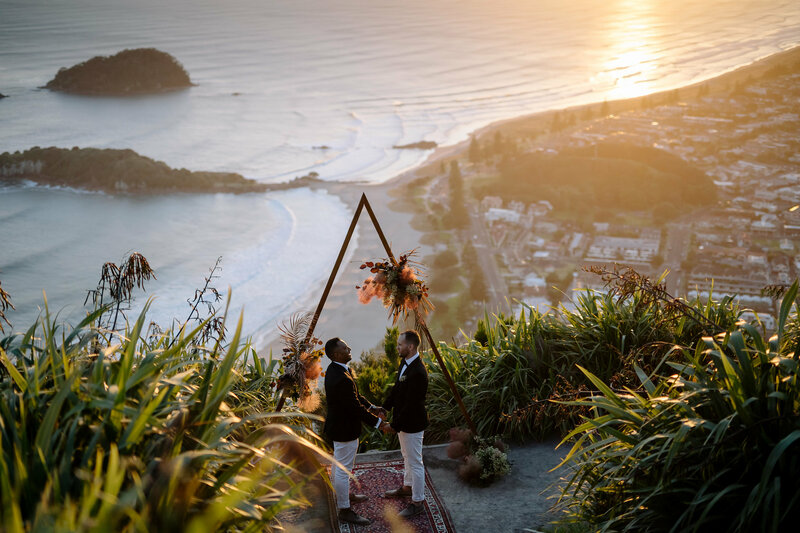 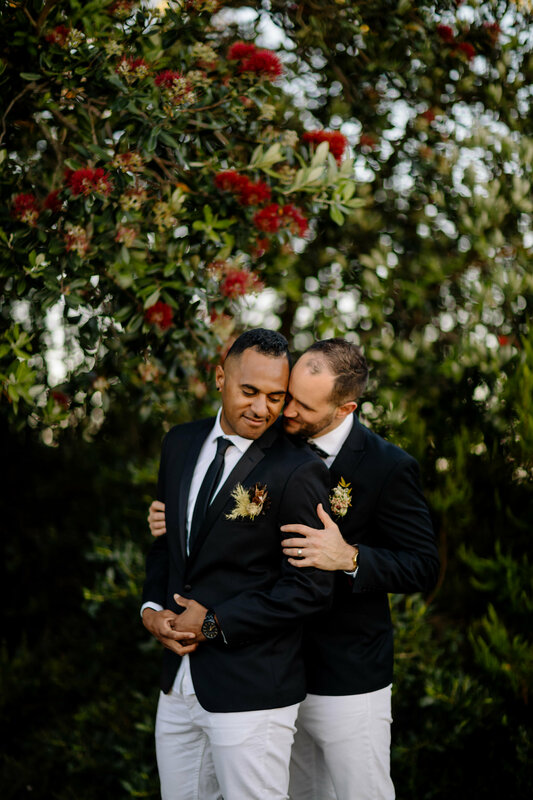 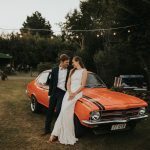 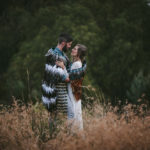 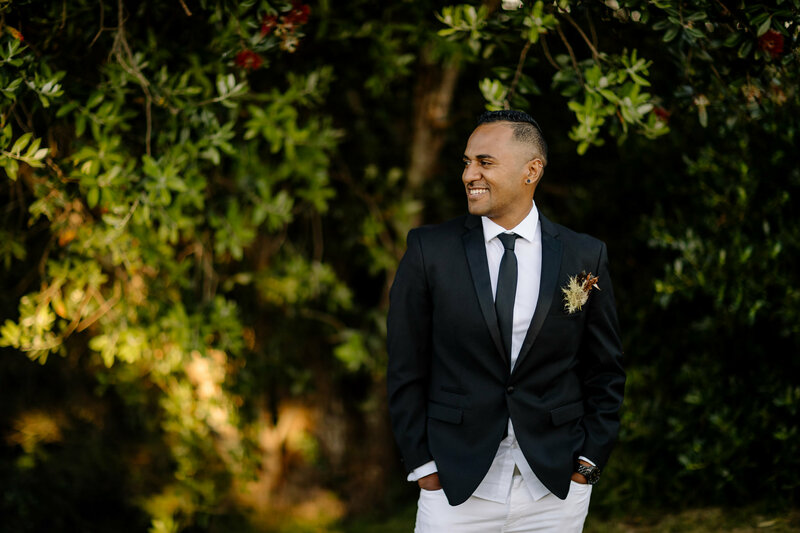 Aaron and Shannon who are the duo behind The Official Photographers captured some truly beautiful romantic moments for this real-life Hamilton couple. 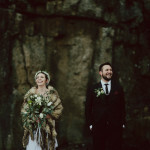 If you want the quintessential example of a sweet, loving and fun couple then Aaron and Theo are it! 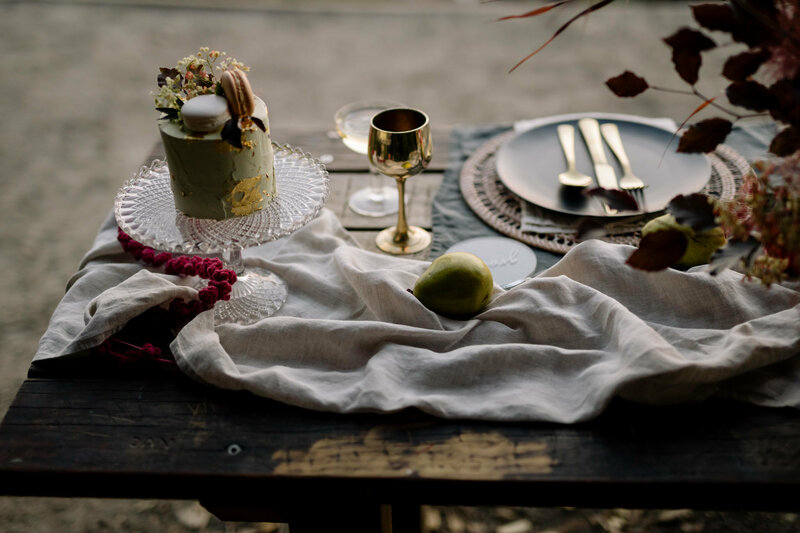 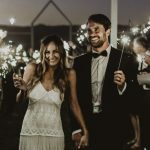 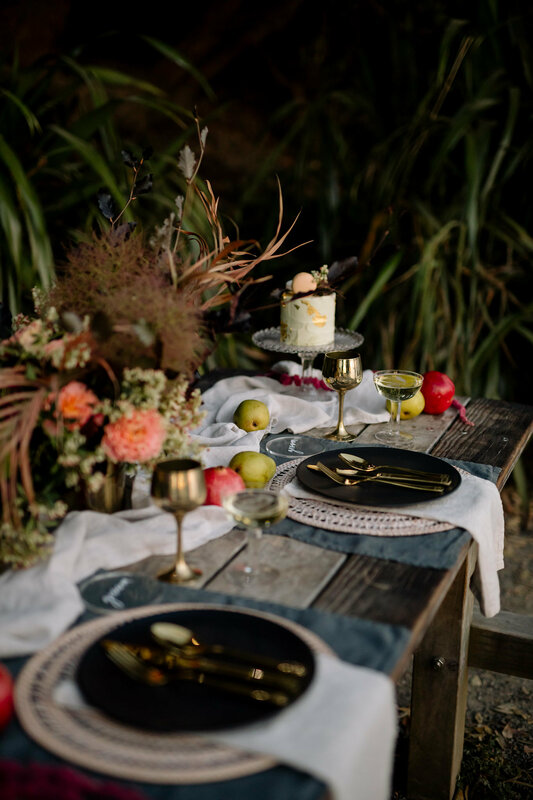 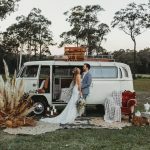 Styling and Props are from The White Wedding Club and Bridget the owner created the most intimate love setting for our couple. 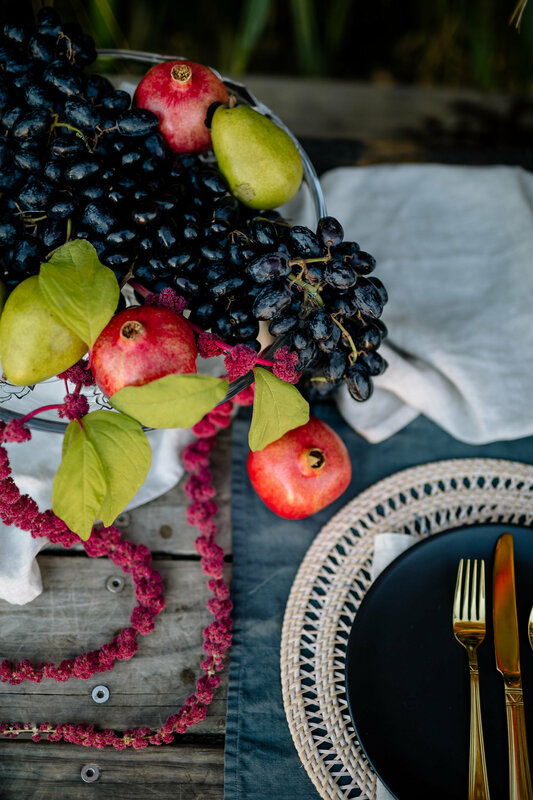 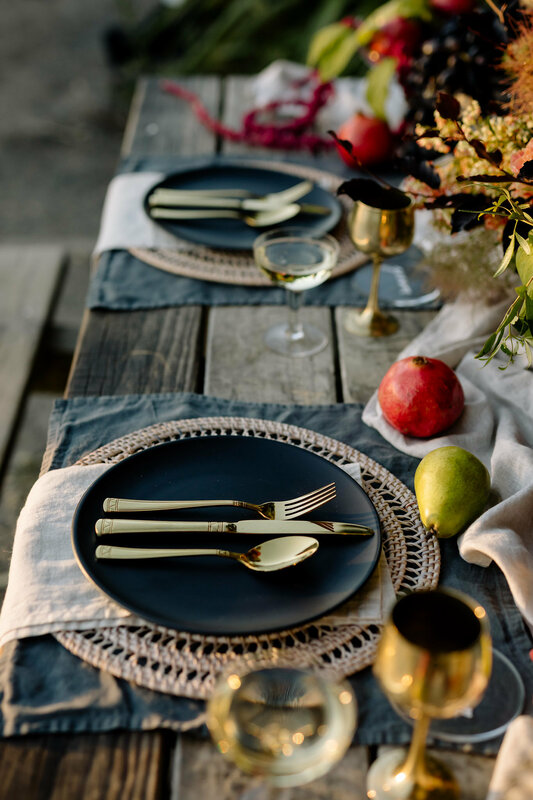 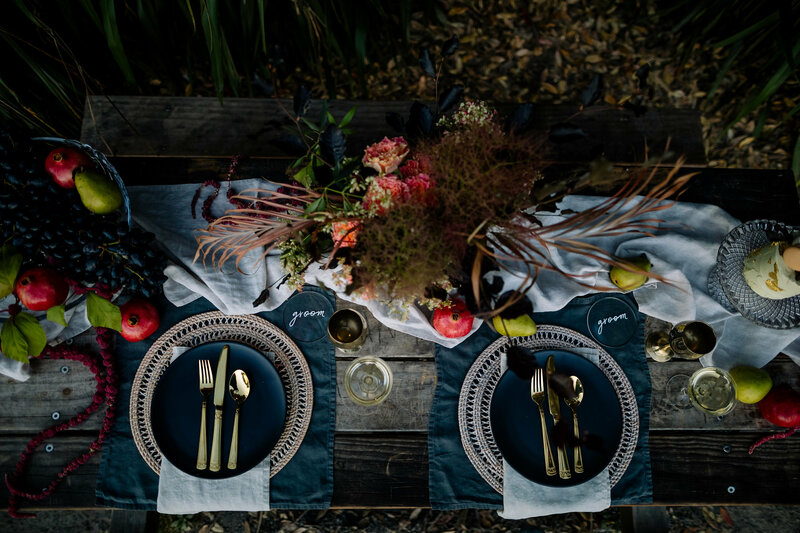 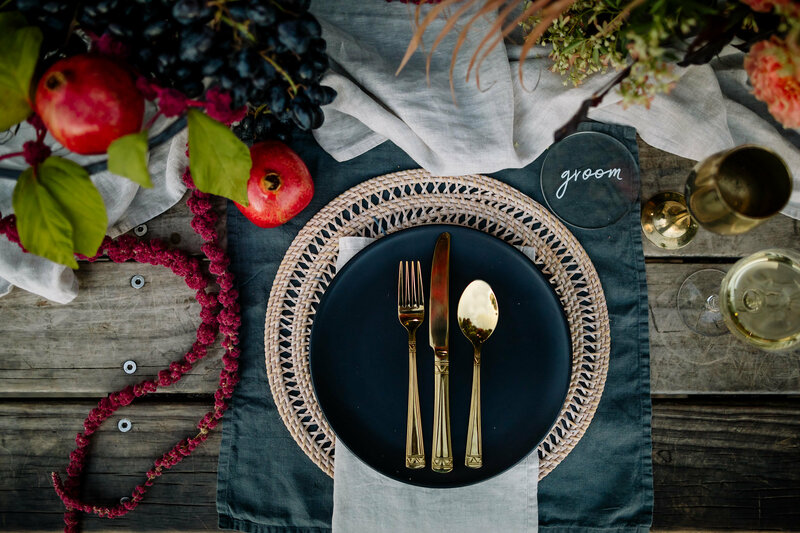 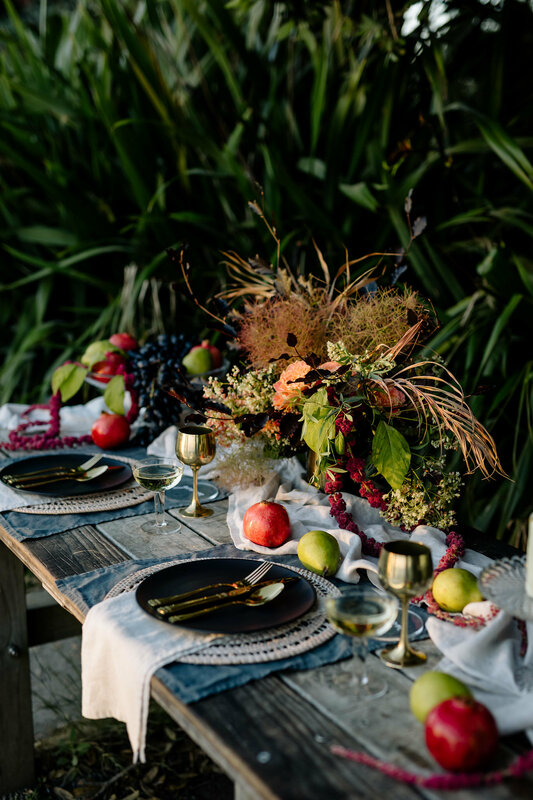 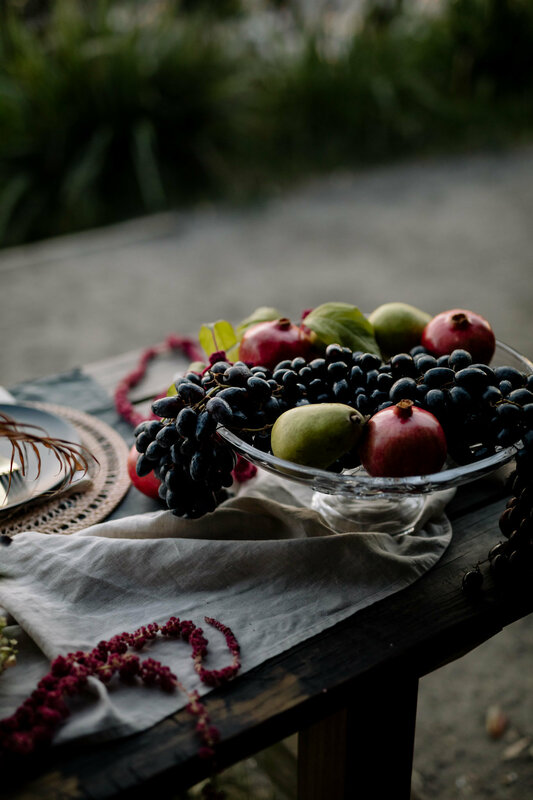 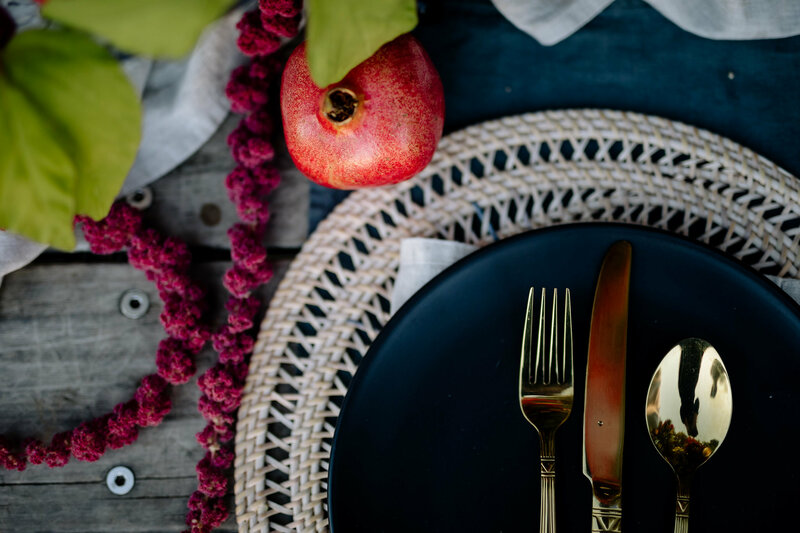 The bold tablescape setting incorporated black plates and deep purple grapes, with a touch of gold and rouge red pomegranates. 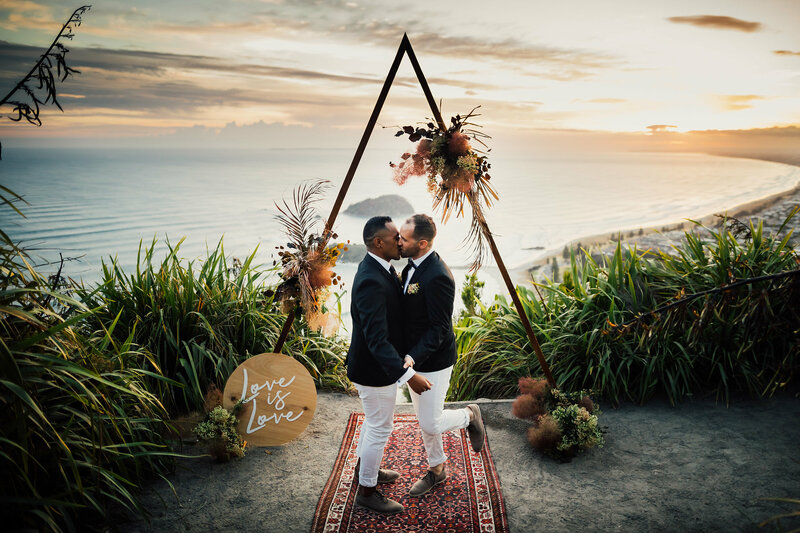 The statement piece, a beautiful eclectic style rug added a luxurious touch to the archway. 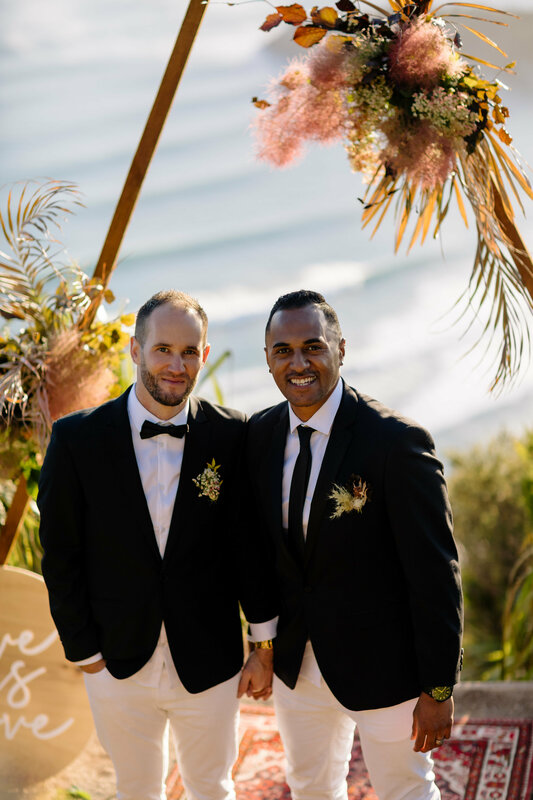 Local Hair Stylist Bret Holmes worked his magic at the top of the Mountain to make sure our two handsome gents were looking their best. 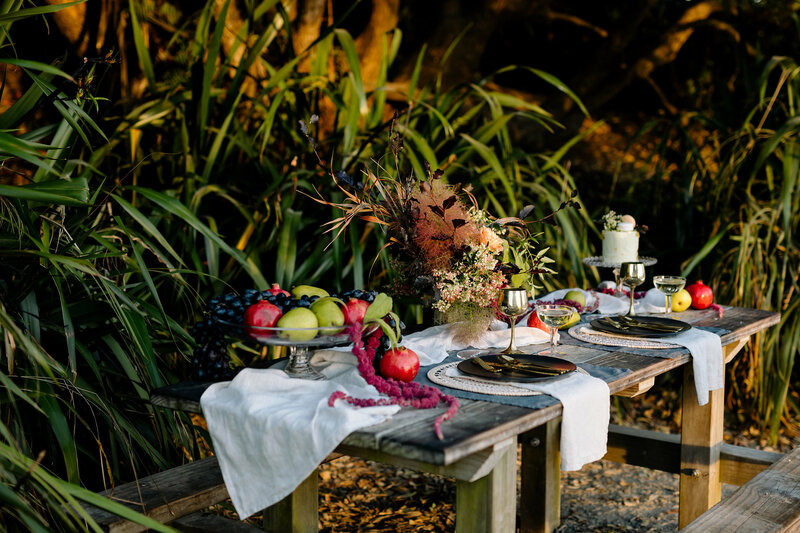 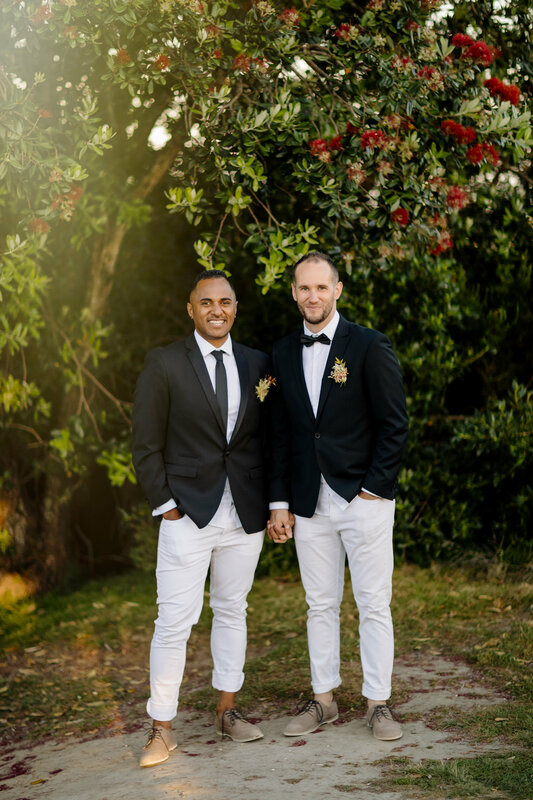 Wild & Whim coordinated the council approvals and Iwi blessings as well as the design styling concept with The White Wedding Club. 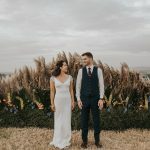 The vendors had so much fun with the overall design, blending the aesthetic concept- which consisted of natural, classic, timeless backdrops adorned with modern elements. 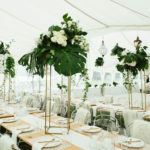 The gorgeous archway was a highlight and was made especially for the shoot and was peppered with a unique assortment of florals of greenery and brush. 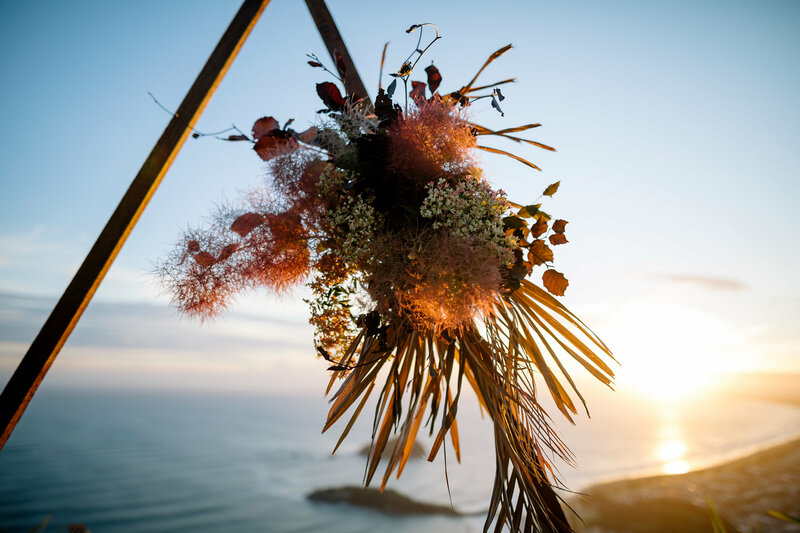 Shaye from On my Hand did a wonderful job of bringing the vision of flowers to life with smoke brush, and dried palms in each of the pieces. 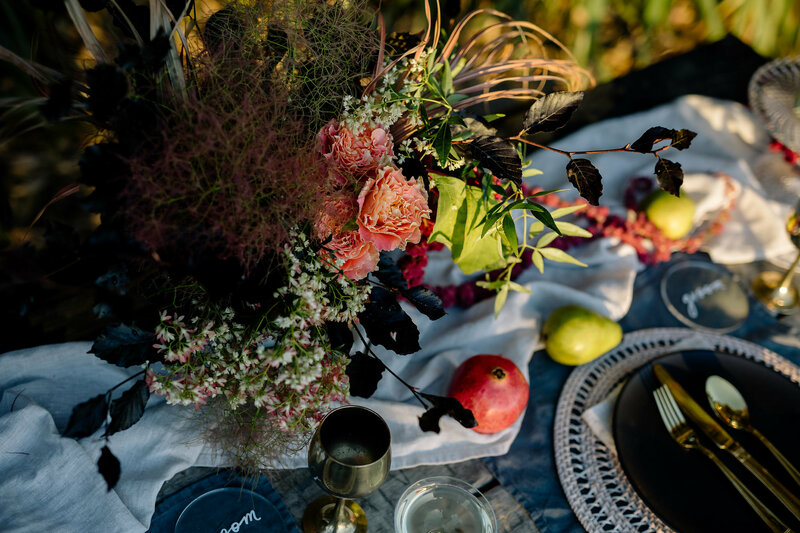 Soft unique buttonholes were beautifully crafted and a centerpiece for the picnic table perfectly punctuated had that wow factor. 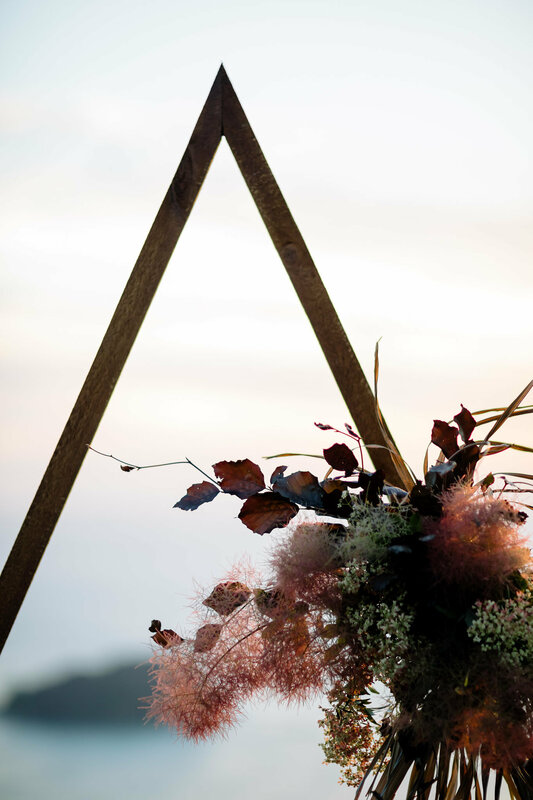 We were especially enamored with the hanging installation on the arch, it was an absolute MUST HAVE from day one. 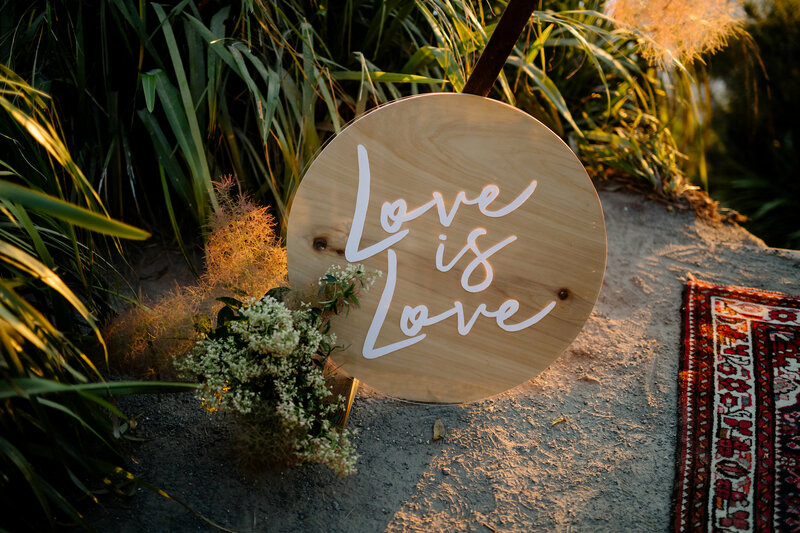 “Love is Love”, this custom made stunning acrylic sign was made by Paper Darling and was the perfect piece to set the tone for the shoot. 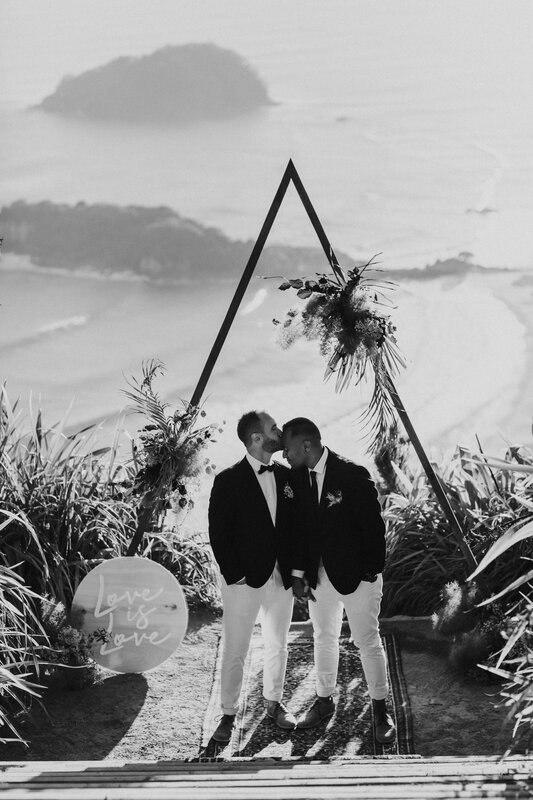 Because when love is love you hike mountains to show it off! 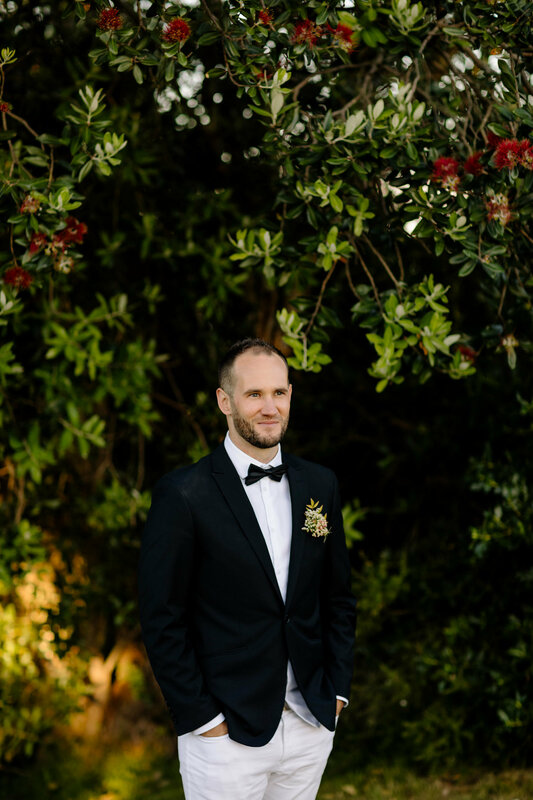 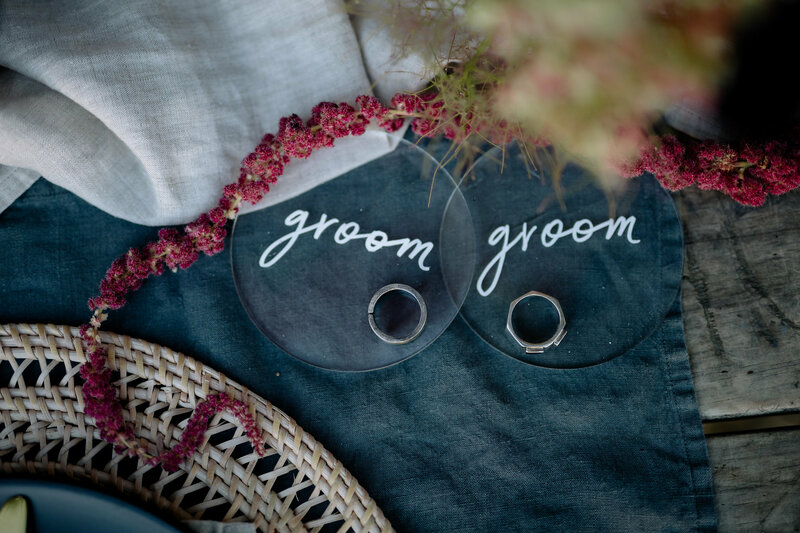 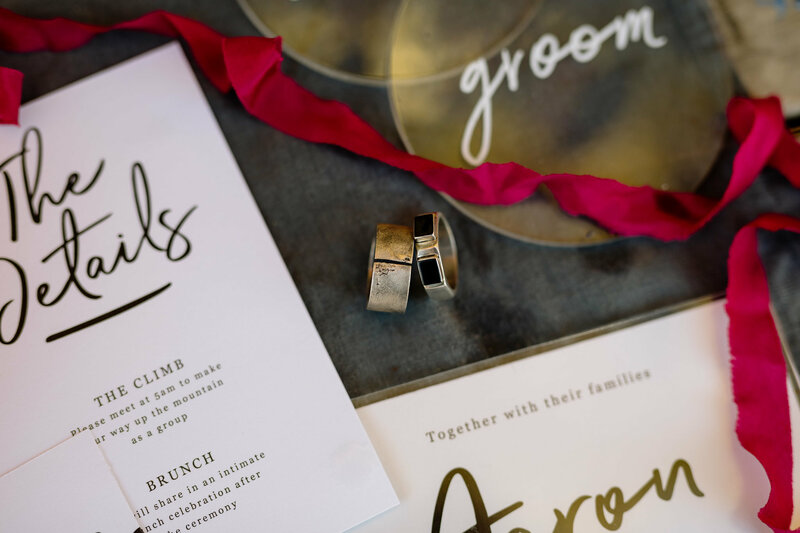 Samantha also created exceptional stationary to fit our modern vibe and match our groom’s attire. 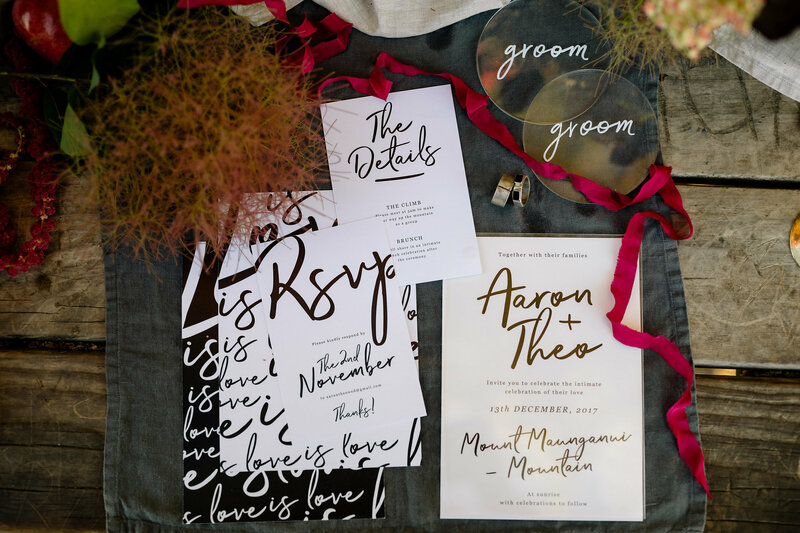 The invitations complimented the entire shoot. 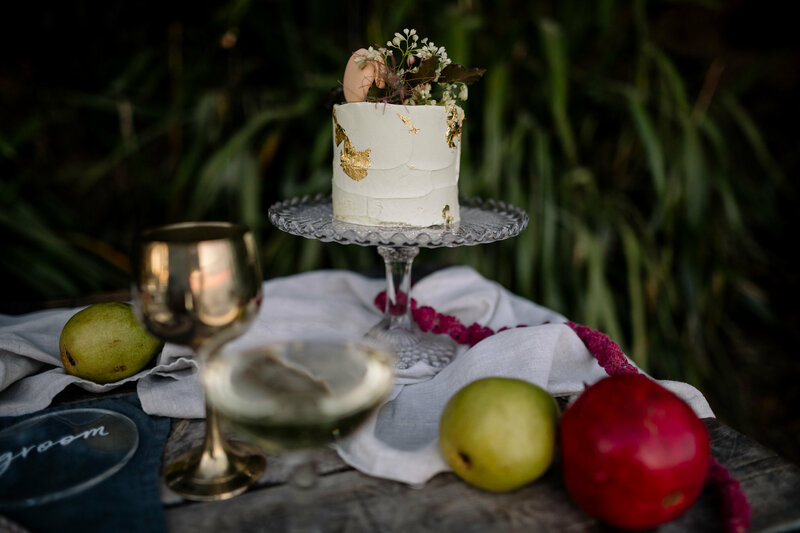 The team enlisted the delectable talents of Spongedrop who designed a cake for this project. 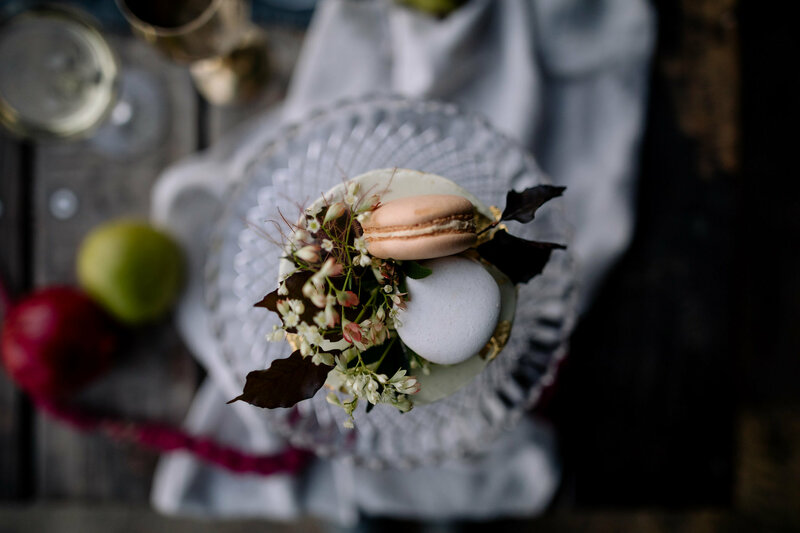 The cake had green matcha and gold flakes, topped with macarons, and tasted as divinely as it looked.